Build a set of devious test chambers and then kill your test subjects in a fire with Valve's official Portal 2 level design toolset. Valve was pretty good at coming up with a large variety of test chambers to befuddle the minds of Portal 2 players everywhere, but I know at least one of you thought you could do better. Now's the time to put your money where your mouth is, as Valve has released a set of design tools so that fans can make their own Portal 2 content. 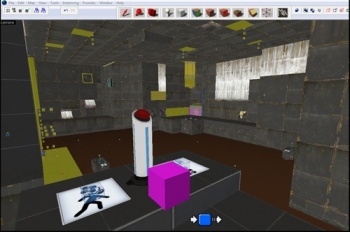 The Portal 2 "Authoring Tools" are currently in beta, so they may not be perfect quite yet. Anyone that owns the PC version of the game can check the "Tools" section in Steam to get started. The Authoring Tools are apparently "versions" of those that Valve used to create Portal 2. For now, they allow users to build single-player maps, co-op maps, new character skins, and 3D models. Users can also create sound effects and music. For more information, visit the Portal 2 blog post here.